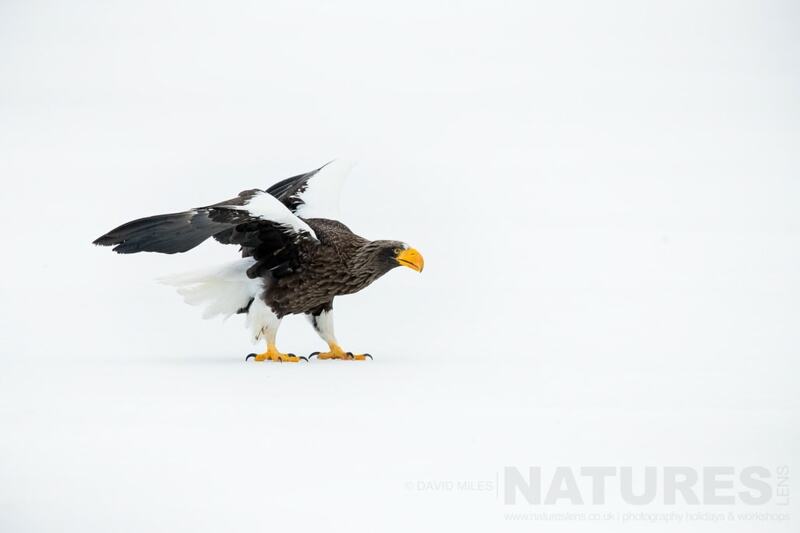 I’ve just returned from spending two weeks, in good company of some great NaturesLens clients, where we were on a trip to attempt photograph the fantastic Japanese Winter Wildlife, including the Blakiston’s fish owl, the red crowned crane, the adorable snow monkeys in their spa & in the snow, the fantastic Steller’s Sea Eagle, & their close relations the White-Tailed Sea Eagle, dreamy Whooper Swans & more in the wintery landscapes of Japan. 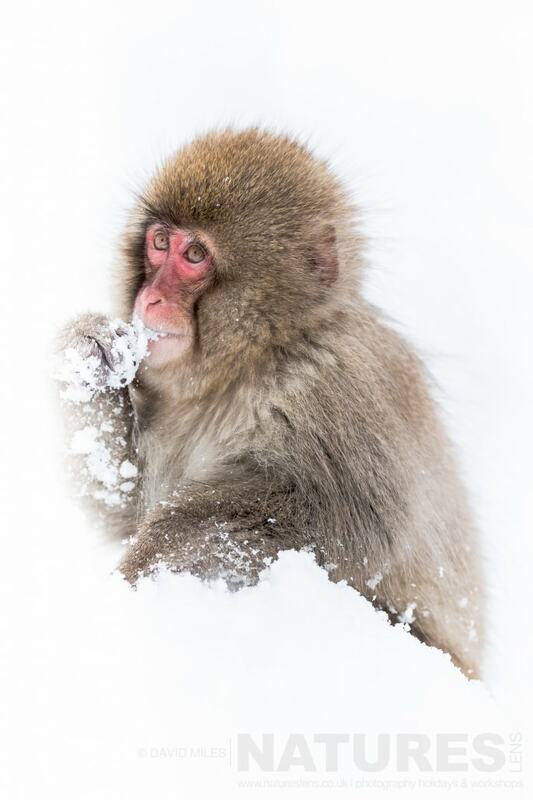 This year, for potentially the last time, we started our Japanese Winter Wildlife trip with the snow monkeys; for next year, we will be starting on Hokkaido & finishing with the snow monkeys, this is mainly so that we can get into a truly wonderful hotel, that no-one should miss out upon. 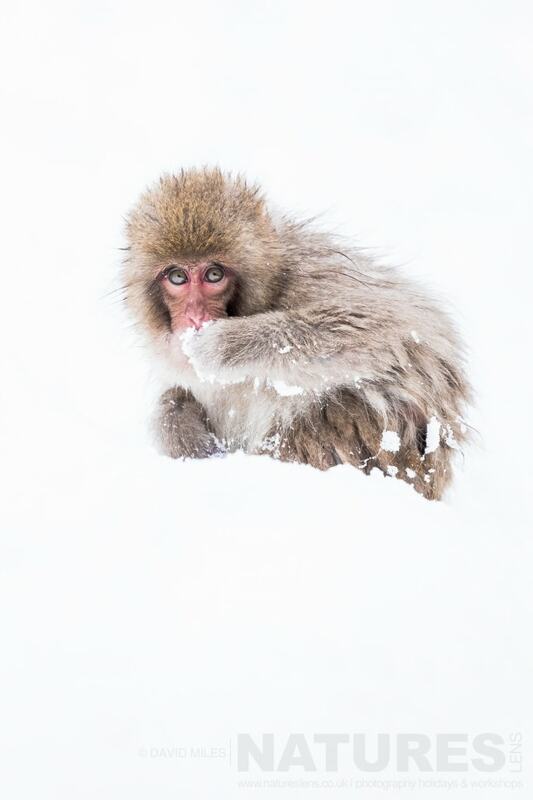 This year, as every year, the snow monkeys did not disappoint, all our clients captured some fantastic images of these primates in their hot spa & in the surrounding snow-clad valley. 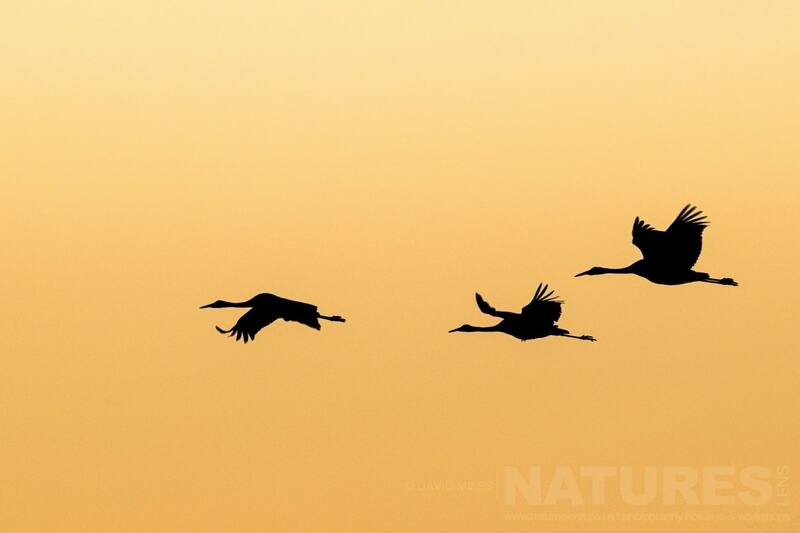 The first photographic target species on Hokkaido are always the red-crowned cranes, every year, we try for sunset, sunrise & daytime images of these graceful birds – this year, we only had a decent sunset on the first day of two in the area, but the cranes obliged & flew over the tree-line & in-front of the setting sun. Moving on from the cranes, we spent several days photographing the beautiful whooper swans on their caldera lake, these are a subject people always fall in love with. Our hotel for the swans was one that boasts wildlife literally outside the windows, & we had a Blakiston’s fish owl & fox come up from the river. The next morning, sable & Hokkaido squirrel were spotted, along with another fox. After a couple of days in the area, we moved on, northwards, three days of bitter cold, early morning starts & a plethora of eagle action was promised, & delivered upon. Each of the days was very different in conditions, with pack ice forcing us back into the harbour on the second day. 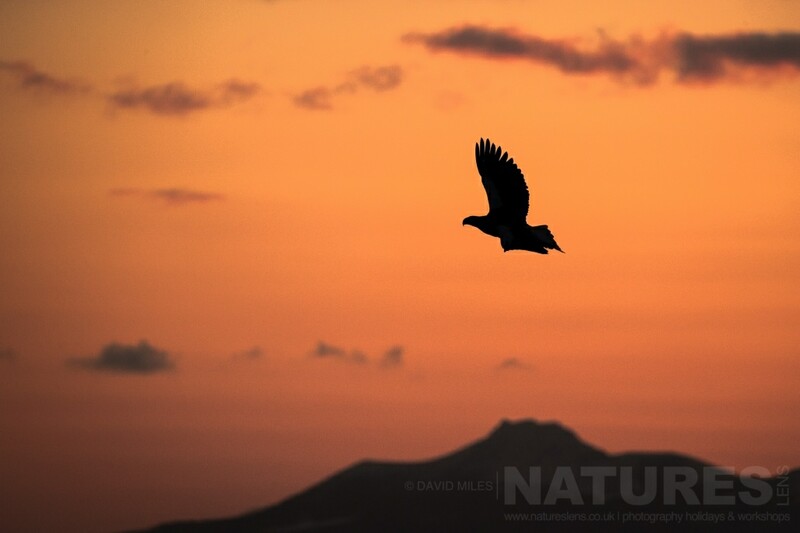 Each day, the eagles kept us entertained & the memory cards just kept being filled with superb images of the birds diving, posing, performing flypasts & more. A quick sojourn down the peninsulas on our way towards the south of Hokkaido, saw us photographing fox & deer in large quantities, & heading to a large frozen lake to photograph the morning squabble for fish amongst Black-eared Kites, White-tailed Sea Eagles & Steller’s Sea Eagles. 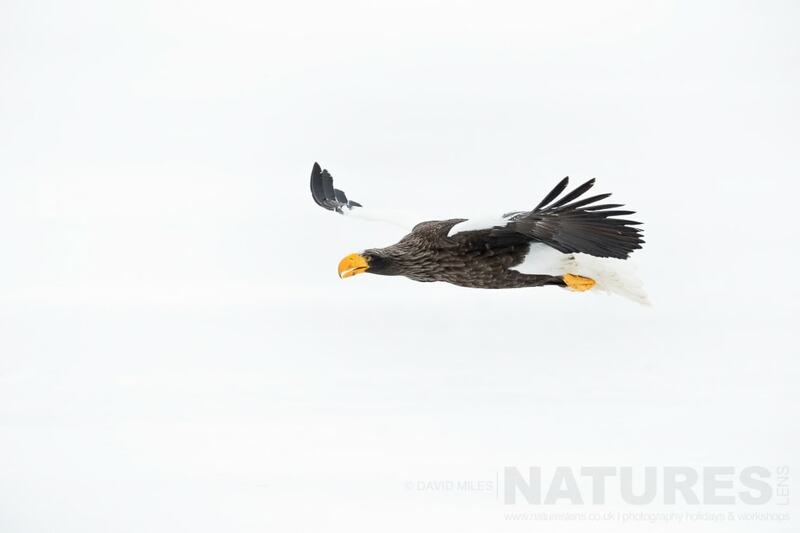 This location produces some of the cleanest background images of the eagles that I believe are achievable, the action is frantic, like a kite-feeding station, the interactions often harsh, but the photographic opportunities are plentiful. February 2018 is yet another return visit to Japan to photograph the various species on offer, including the blakiston’s fish owl, red crowned crane, snow monkey, stellers sea eagle, ural owl, white tailed sea eagle, whooper swan & more; so if you fancy photographing the wonderful winter wildlife & the amazing bleak landscapes, whilst absorbing the culture & everything else Japan in Winter has to offer, then join me for this spectacular Winter Wildlife experience, all the details of the Japanese Winter Wildlife photography holiday may be viewed here. 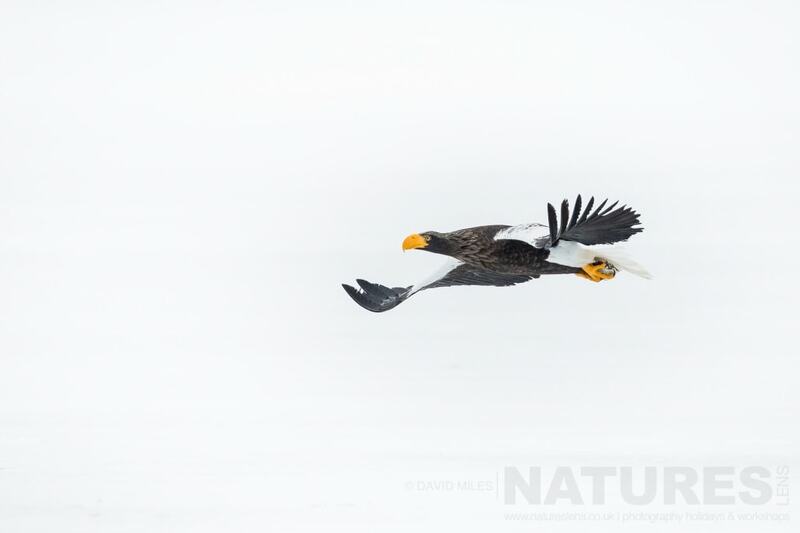 This entry was posted in announcements, galleries, reports and tagged blakistons fish owl, japan, no single supplement, red crowned crane, snow monkey, steller's sea eagle, ural owl, white tailed sea eagle, whooper swan, winter. Whatever your query regarding our photography holiday, Another successful Japanese Winter Wildlife tour to Hokkaido & Honshu, please fill out your details below & we will get back to you.